Although superhero and YA dramas are The CW’s bread and butter, during the summer months, the littlest network mostly features unscripted series. This time around though, they’ve introduced two new scripted series, The Outpost and the Burden of Truth TV show, which premiered during the same week. 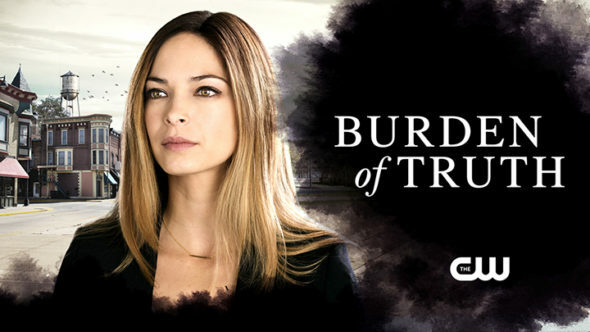 While the former fits in with CW’s usually fantasy drama fare, Burden of Truth, which originated on Canada’s CBC, is a legal drama. It’s been renewed in Canada but, can it draw a large enough audience to be invited back to the States for a second season? Will Burden of Truth be cancelled or renewed for season two on The CW? Stay tuned. *Status update below. A CW serial drama from creator Brad Simpson, Burden of Truth stars Kristin Kreuk, Peter Mooney, Alex Carter, Star Slade, Benjamin Ayres, Nicola Correia-Damude, Meegwun Fairbrother, and Sara Thompson. The series centers on attorney Joanna Hanley (Kreuk), who walked away from her partnership at a corporate law firm in order to figure out why a mysterious illness is afflicting high school girls from her home town. Back in Millwood, Manitoba, on the Canadian prairie, Joanna joins forces with her old high school foe, Billy Crawford (Mooney), who is now a local attorney. While she’s trying to get to the truth of what’s happening to these girls, she must also face why her family fled the town, years ago. What do you think? Do you like the Burden of Truth TV series on The CW? Should it be cancelled or renewed for a second season? *10/10/18 update: The CW has picked up the second season for Summer 2019. Details here. I enjoyed the show. It was an investigative/law show. I could be biased having been a litigation paralegal specializing in liability cases. I’d like to see a criminal case branch off from this season. Such as, Ben owner of the Steel company ends up dead of an apparent suicide but it’s not. Bring back all the people from season one as they’d all be suspects, including his daughter. Just one way the writers could go. Really enjoyed the program, but feel it should end as is. I really enjoy this show. Hopefully, the CW will pickup season 2! I really enjoy this show. Hopefully, the CW will pick up season 2! I think it’s a great show to show what really goes on behind the scenes with lawyers. SOME People truly don’t understand how much really goes when trials happen. INVESTIGATION is the biggest and longest part. I love the show me and my husband watch it all the time. Plz bring it back for another season. I find this to be a great show, despite typical one-type american legal drama series, this is 100 % Canadian and has impressed me from the very start. Kristin you’re the dynamo behind the series, well produced, well written, don’t cancel it because of annoying small-minded people who think only that their opinion must be superior above everyone else’s. Bring it back for another or more seasons, don’t change the cast or reboot characters, it’s perfect the way it is now. Thank you. Love this show. Hope it gets another season. I know a lot of folks who watch this. They may DVR and watch later but would love to see it continue. We chat about it a lot. Kristin I watched you on Smallville. I supported you by watching Beauty and the Beast. I can’t watch this show. Too boring to care about. You are on your own with this one. Good show so far. No lawyer stuff so far. Investigation now. Actually a thinking show for this mind numbimg channel. Law shows are always very boring. Therefore, There is no hope for this one to leave Alive.